First up I purchased the Stila One Step Correct. It's a 3 in 1, primer, corrector and skin perfecter. I added it straight to my basket for all of those reasons. I needed a new primer, I wanted something to brighten up my face (namely those dark pesky sleep deprived reminders under my eyes) and also try to soften the redness of spots and blemishes. So I was really excited when it arrived, and I love the Helix design as well as the packaging. I was impressed. It glides on silky smooth, leaving a dewy but not sticky trace to prime before my foundation. I truly am impressed by it's use as a primer, it's perfect. It feels hydrating, fresh and lightweight. As for the correcting balance, I don't know.. perhaps I was expecting too much? I know that unfortunately you can't just rub out blemishes (wouldn't that be the best thing to ever exist) but I was expecting maybe just a teeny tiny bit more!? I don't think it did too much to counteract redness for me, or really banish my dark circles.. however having used it now for almost 2 weeks, I am noticing my eyes do seem brighter than before I had the product, I just wish it was more. I think if I was to sum it up, I would say that I'm happy I used points to pay for the product than splashing out cash, so it didn't really cost me anything. I'm happy I tried it, and I will continue to use it as a primer... but I think I would be inclined to try a different brand once it runs out. 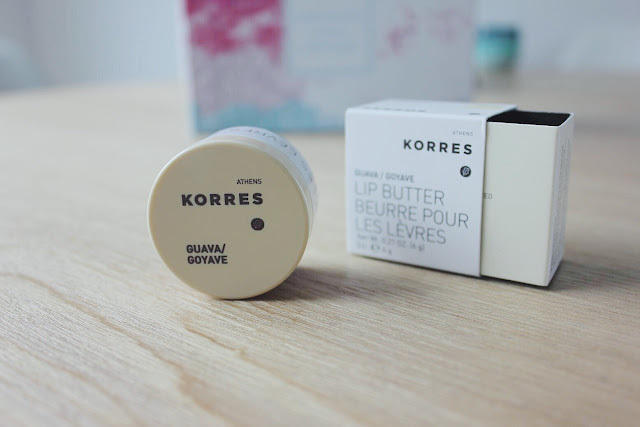 Next, the Korres Lip Butter Pot in Guava. This was a total whim buy, but actually I did fancy something to keep my lips hydrated for my flight. I wanted something to round up my checkout price to make the most of my points and this was £7. I probably wouldn't normally spend that much on a small 'lip balm' type product, but again it didn't cost me anything, it was rated well, and it sounded delicious. 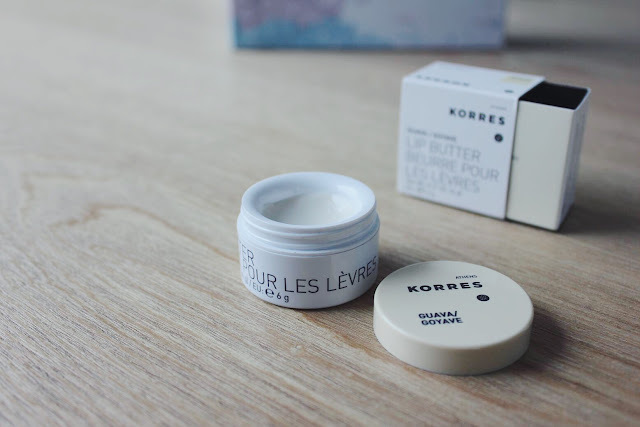 OH my goodness, I absolutely love this lip butter. The packaging and branding is so well thought out it's clean cut, smart and has a luxurious vibe to it.. I've said it before, but I truly am a sucker when it comes to packaging. The pot itself was just as well thought out, with a smooth lip, raised specifically (I think, or it was simply a fluke) so that when you dip your finger in, it's practically impossible to dig your nail into it or scoop out too much. That's one thing that usually annoys me with potted products, I'm so pleased they thought this one through!! 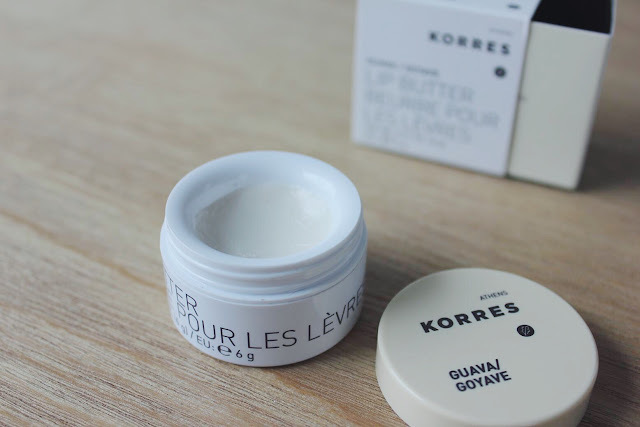 Anyway, I'm sure you're ready to hear about the actual lip butter. And I can tell you, I was equally over joyed and actually surprised by it too. The smell is out of this world. I was actually with Arthur the little Pug I look after when I opened my package and had a little try. He was curled up fast asleep, but he caught a whiff of the Guava and he went crazy. He loved the smell I think as much as me, and kept trying to lick my lips and wouldn't settle back down, I think he thought it was a treat! So if the scents anything to go by, you for a pugs seal of approval. The texture is like a sticky, glossy, butter. It feels very thick on (in a silky, luxurious way if that makes any sense) and is white in appearance. But it soon soaks in and turns transparent. The only downfall is that it is very tacky, the type where the wind blows and your hair sticks to your lips! So for me, it's not a suitable 'everyday' wear product for me. Having said that, I absolutely love how much moisturizing it is and it is perfect now that the whether is turning colder and my lips are becoming dry - it's a great remedy so I've been using it at night before bed. I will taking this in my hand luggage too as it'll be a great for on the plane to keep my lips from drying out. I really do recommend the product, I do love it - it's just not something I can apply all day long. Now, I've saved the best til last. The game changer that is.. Paula's Choice Skin Perfecting 2% BHA Liquid Exfoliant. This was one of the sample products in the Birthday box. Most people either got this or the Laura Mercier Face Polish (which is what I got) so I didn't actually get to sample this one. But i'd been reading reviews and kept hearing people raving about it!! BHA is salicylic acid... sounds scary doesn't it!? I was a little bit dubious but there was nothing but positive and quite frankly amazing reviews. So I used up the last of my Birch Box points and it soon arrived to my door. Just as a quick background on my skin. I have suffered with acne since around the age of 9 or 10. The bulbous, angry, sore spots have gotten 'better' as I have grown older but in it's place have remained extremely deep pores and under the skin spots/sacks. My pores continuously fill due to my oily T-zone and so i'm constantly battling with white/blackheads.. I know it sounds gross, but it's the truth and no matter my diet or what I wash with or how often I wash with it, it never changes!! And just to add to that drama, I have very dry cheeks too. So I have a constant battle and when 'Mother Nature' comes to call she brings along an army of extremely sore, red angry lumps!! The product is just like water in consistency, with an ever so slightly greasy feel. You just apply a few drops onto a cotton pad and after you've cleansed your face you apply it. When I first used it, it did tingle where I had broken skin and sore spots.. it worried me at first, all I kept thinking of was the fact it was acid.. burning acid!! But it hasn't done since. I've been applying it day and night for just over 2 weeks now.. and oh my goodness. It is INCREDIBLE. As well as using it all over, if I do have a little breakout (it's been rare) I just apply a little with a cotton bud and it seems to stop it in it's tracks! I've noticed a big change in every area. My face feels tighter (firmer) where my pores have visibly shrunk. My face is noticeably less oily, and my breakouts are pretty much non-existent. I really cannot believe my eyes. The spots under my skin are tough and stubborn and I know it's going to take a while to get rid of them all, but it's really evened out my complexion and smoothed my skin and with make-up (which I only need a thin layer of foundation now!!) i'm absolutely over the moon with the difference. I really cannot praise it enough, I've tried soo many products and brands over the years and nothing comes close. I'm really so much more confident in my appearance and I just wish I'd found it sooner! And there you have it, I hope you've enjoyed my little review - i'd highly recommend looking up the Paula's Choice Skin Perfecting Liquid if you're suffering with skin like mine.. it is truly amazing!! I only just spotted this comment!! Wow, i'll definitely have to see if that store is still around, I would love to visit. I recently purchased a pomegranate face scrub from them and it is lovely!! I really am won over by the brand! My October Birchbox - Stylist's Pick!